You are currently browsing the tag archive for the ‘Toothpick trail’ tag. Margaret and I went to Ashland for Shakespeare as I wrote about earlier, but also to explore the local area a little bit. Sunday we went to Wildlife Safari, that I covered in my last blog post. Built in 1883 and continuously operating since then. After Wildlife Safari, we stopped at The Historic Wolf Creek Inn for a cocktail. This stop was a delight because it’s in the middle of nowhere and I didn’t know anything about it other than having seen the highway signs for it for many years as I passed through on I-5. 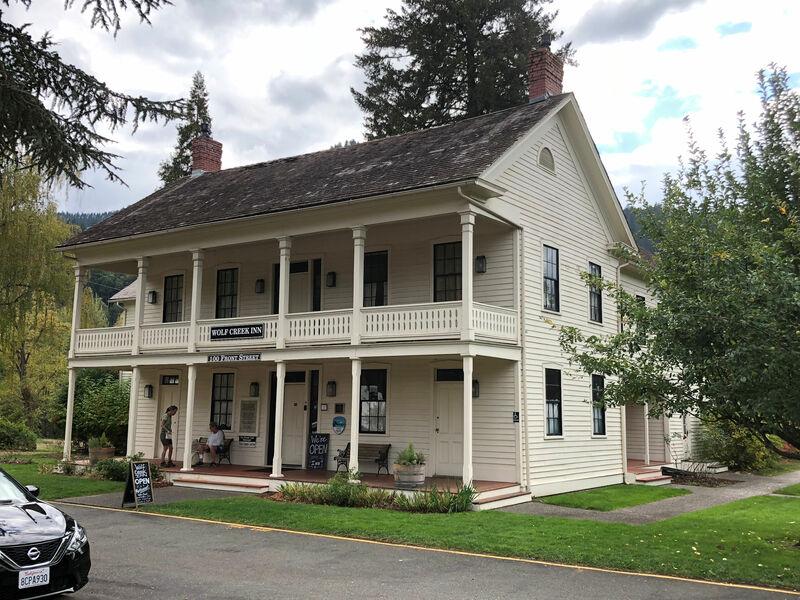 Henry Smith built his third hotel to be “the upscale one” along the stagecoach route. 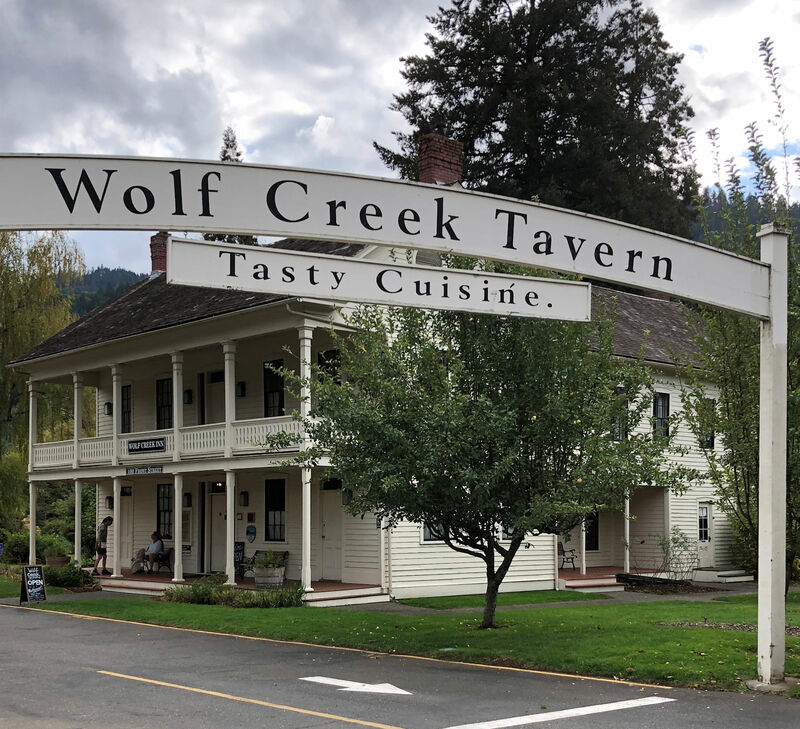 Built in 1883, Wolf Creek Inn is the oldest continuously operated hotel in the Pacific Northwest. Famous guests include Clark Gable and Carol Lombard, and the bed they used is still in use today in the largest guest room. Mr. Gable liked to fish in the nearby Rogue River. 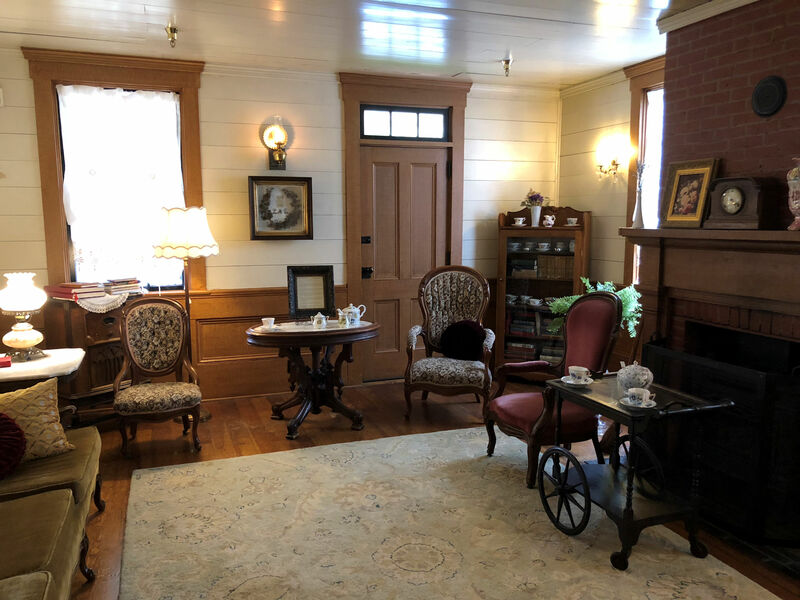 The most famous guest was Jack London, whose room is considered so special it can’t be touched, and everything is maintained today as it was for Mr. London when he occupied it. 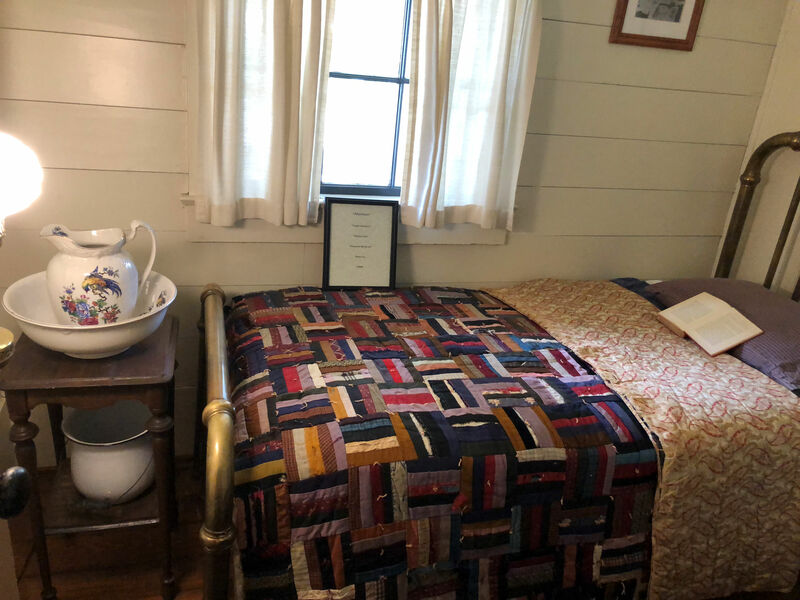 Jack London’s Room. Complete with Jack London’s chamber pot. 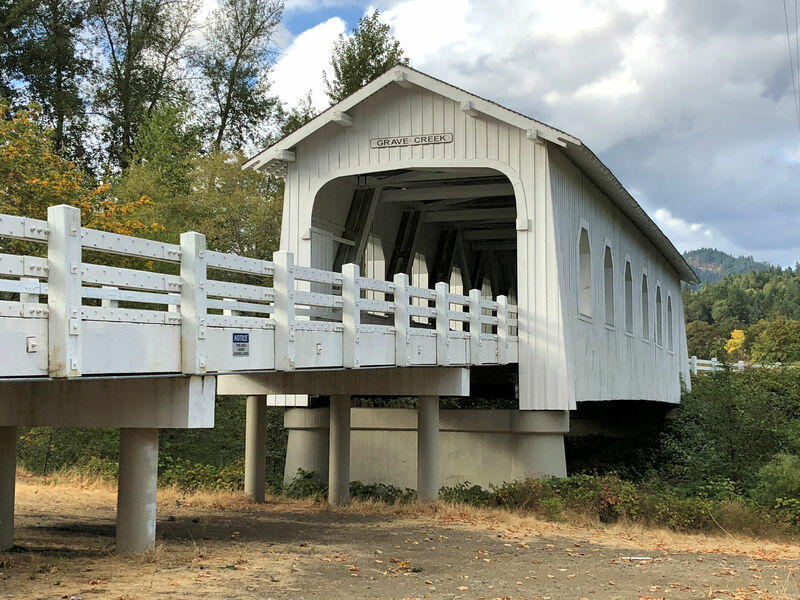 Our next stop was to find a covered bridge. Oregon has many, and I never tire of seeing them. Touring Wildlife Safari, then Wolf Creek Inn, then a covered bridge, was enough adventure for Sunday, and we dropped to sleep happy at our hotel in Ashland. Monday morning we left to try to find a trail to the top of Table Rock. This is a volcanic mesa with a wide flat top that is easily seen from I-5. 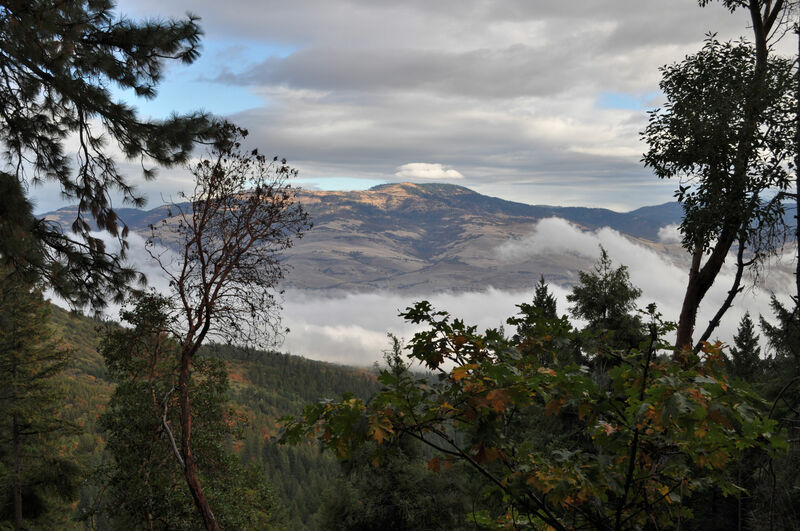 We found trail descriptions for Upper Table Rock and Lower Table Rock trails and made a wild guess that the one we wanted was “upper,” since we didn’t know there was another one, so the other one must be “lower.” We guessed wrong. But the trail was wonderful. Up close look at the anthracite formations at the beginning of the trail. 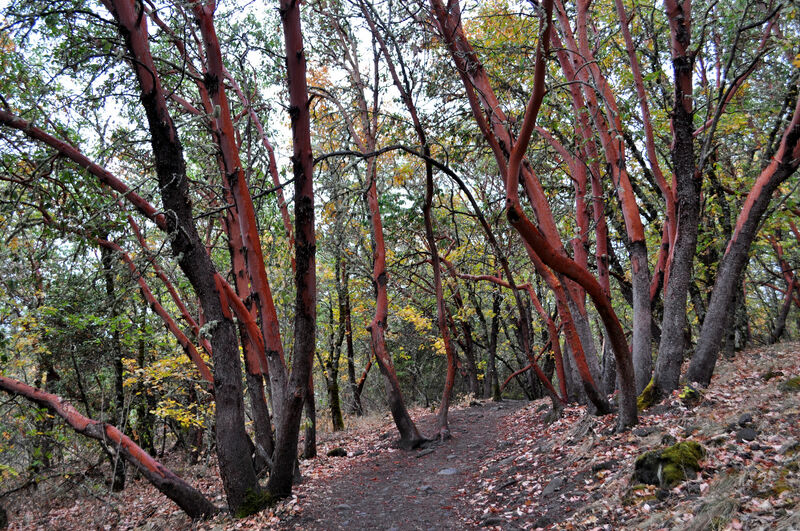 Fabulous red trunks of madrone trees that are common along the Oregon coast. 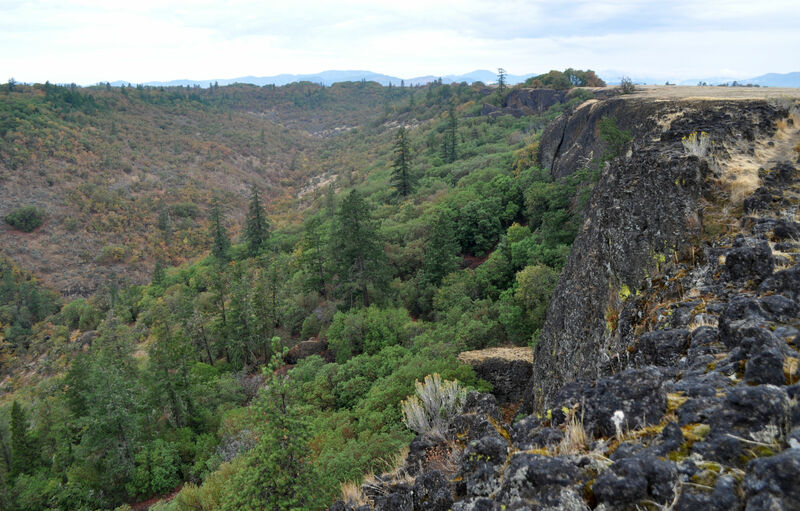 The trail was super short and easy, but Margaret and I extended our time there by delighting in the beauty of the views and the lovely forest of black oaks and madrone. 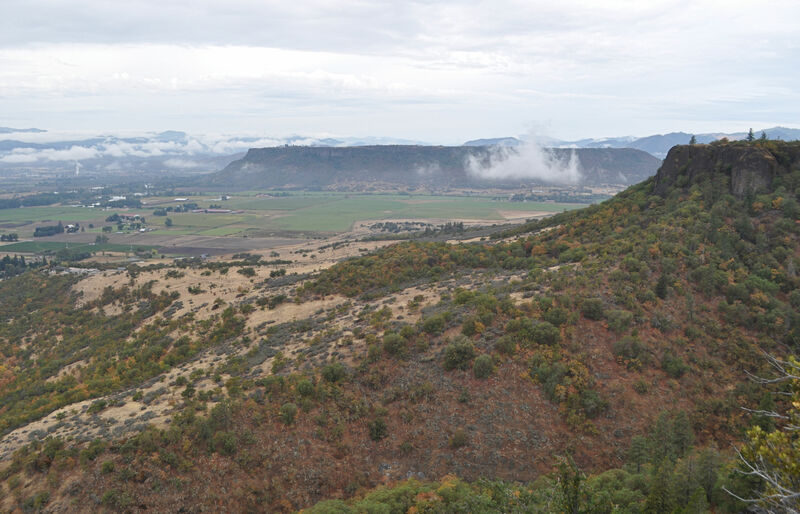 At the top we headed directly for the edge of the mesa and were impressed with views of the Rogue River Valley. 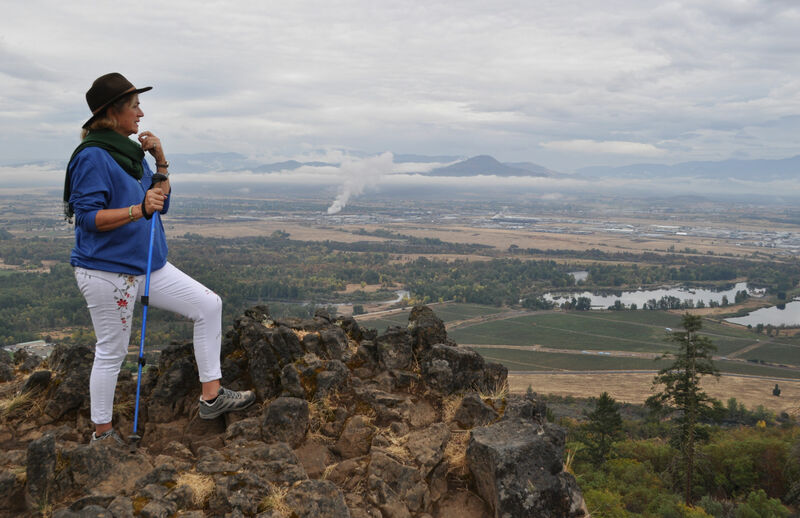 Margaret looking toward Medford, Oregon. We chatted with other hikers up there as well. In the distance I spotted Lower Table Rock, the one I’ve seen a hundred times from the Interstate. Canyon in the U-shaped mesa. 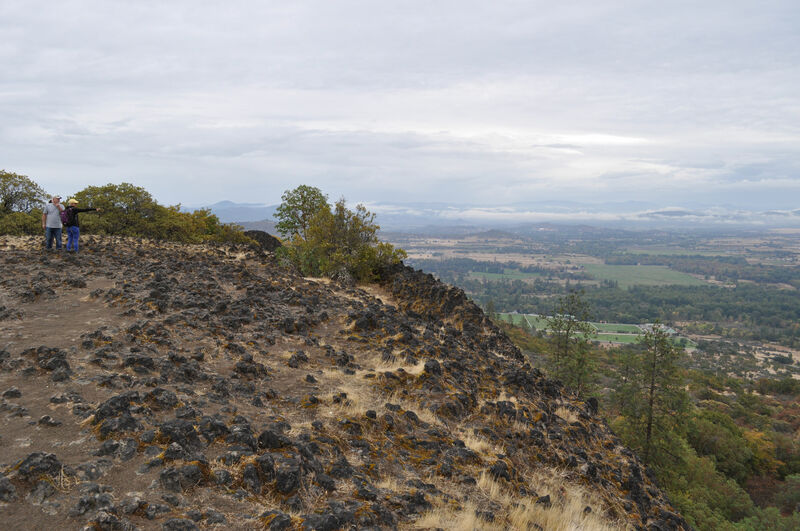 The top of Upper Table Rock is not as flat as I assumed it would be. 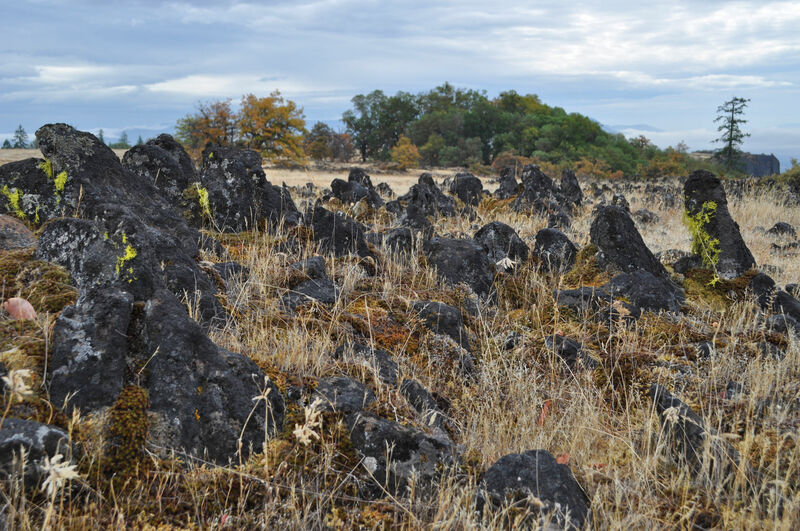 As an unrepentant volcano-lover, I was excited to see these formations. After our hike we went into the darling town of Jacksonville to wander shops and antique stores and enjoy the lovely weather. Next we went to the Rogue Creamery Cheese Shop and sampled some too-die-for blue cheeses. I confess, I purchased a couple pounds of it. Across from there is Lilliebelle Farms Handmade Chocolates, where we also sampled. I was tempted by the chili chocolates, but ended up purchasing the lavender sea salt caramels. On Tuesday we decided to find another hike before our matinee show. This time we chose what looked like a loop, titled Toothpick Trail to Catwalk Trail Loop in our hiking app. It was a forest trail with a single view of something other than forest, very little interesting nature, and in the end, no loop. Turns out, there is a road the trail eventually intersects with, and you can return down the road, making a loop. Not what we had in mind. The one and only viewpoint from Toothpick Trail was indeed lovely. Intrepid hikers that we are, we found things of interest anyway, to keep our spirits up. As with the hike the day before, this trail was super short and easy, so once we realized it connected to other trails, we just kept going. There is a maze of trails on top of the ridge, and I was tickled to find their names all Alice In Wonderland themed, such as Caterpillar, Lewis, Jabberwocky and Bandersnatch. These trails are popularized by mountain bikes. We were passed by multiple people on bikes, all of them polite and careful not to run us down. There were plastic ribbons strung between trees all over the place to keep the bikes on the best paths, lots and lots of warning signs and informational signs for the bikers. Probably helpful for them, but really ugly for us. We were intrigued by the trails built with humps and banked corners for bikes. This is trail construction we had not seen before. 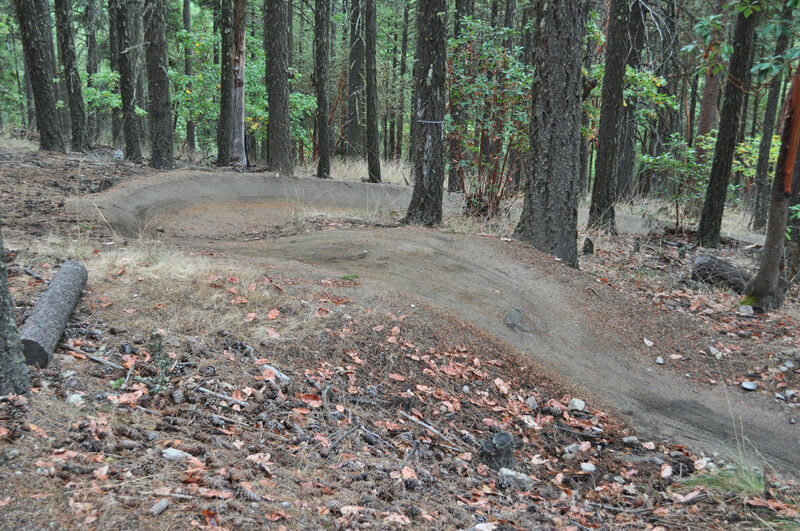 Humps and banks built for mountain bikers (I cropped the photo to remove all the plastic tape strung between trees). 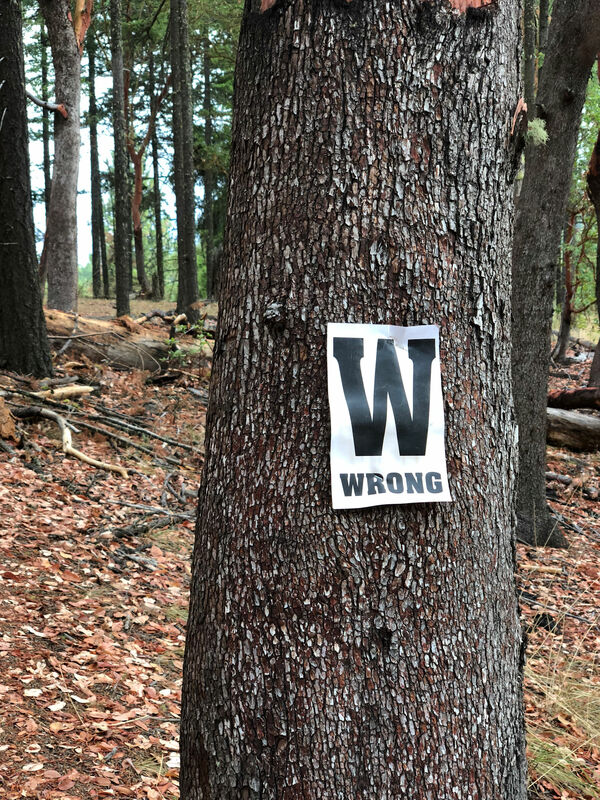 Trail marker for mountain bikers. The other amusement we found on the trail was when we came across some experienced older male hikers. M and I must have looked dubious in our light, girly tourist clothing, carrying no pack whatsoever and a single water bottle between us. Makeup, jewelry… you get it. No one else knows that M and I both have over twenty years of backpacking experience. The reason we showed up looking completely unprepared for the forest is because we are *so* experienced that this truly was like going for a walk for us. None of these trails was more than a mile from a road, we were merely trying to kill time waiting for our Manahatta matinee down the hill in Ashland. We weren’t winded in the least, and did not consider the trails a challenging hike. So. We spot some other hikers and we beeline for them, because we’re hoping to get some insider knowledge on how to make an actual loop out of all this hilltop wandering we’ve been doing. There are three men, 50-60 ish, in full Outdoor Gear, hiking poles, day packs, water bladders, specialty footgear, protctive hats – all of it. They tell us they are locals and hike up there all the time. They are immediately concerned for us, considering that our first question was “Is there a trail over on this side of the mountain that will link us back to Toothpick Trail?” which they interpret as us saying, “We don’t know where we are.” They ask us if we’re hungry, can they share their water with us, are we lost, are we ok? Oh good grief. I don’t think they ever really understood what we were doing up there. We kept saying we were fine, we weren’t worried or lost, we were only trying to make a more interesting hike. They assured us that there was no link back to Toothpick Trail and our best bet would be to return the way we came. “Can you find your way back?” they asked. We managed not to roll our eyes and waved goodbye and thanks. I hope none of them lost any sleep worrying that there would be two emaciated and terrified women trapped on the hill that night. I imagine that must happen around here, with the bazillion tourists who show up for plays like we did. We got to the play on time and now the timeline goes back to my original post of this trip. 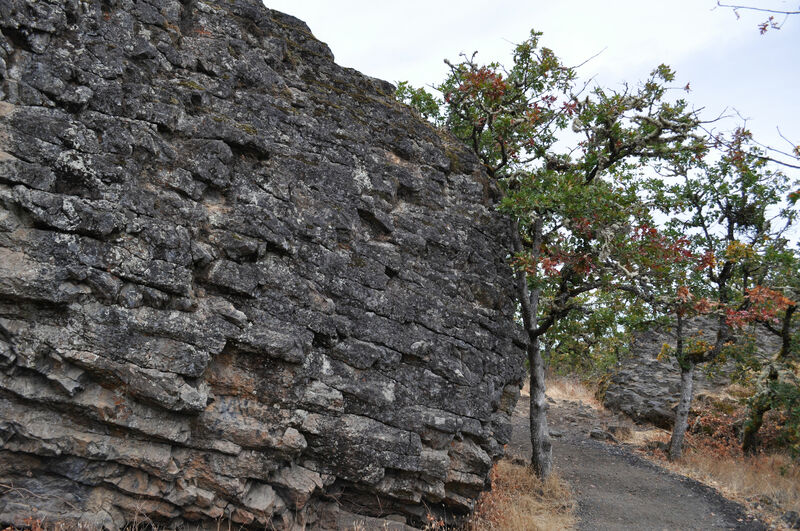 * Quick research on Wikipedia indicates that the Table Rock Reservation lasted a whopping three years. After which, fighting broke out again. Some Indians were marched Trail-of-Tears-like, on foot 300 miles to another reservation; others were put onto ships and moved, all of them that lived eventually ending up on reservations south of Portland.